Lucio Fontana’s slashed canvases inspired the Emilio de la Morena Spring/Summer 2011 Collection. Other Lucio Fontana-inspired collections : Alberto Marani Spring/Summer 2011 (in part), Grès Couture Spring/Summer 1976 (dresses with slices and slits), Jeremy Laing Spring/Summer 2009. Moreover, in 1961, Bruna Bini unveiled some artists’ dresses, including one that was created by Lucio Fontana, and in 2005, Anne Valérie Hash confessed that Lucio Fontana was her main inspiration. Several outfits in the Balmain by Olivier Rousteing Autumn/Winter 2012-2013 Show are inspired by the Russian churches. 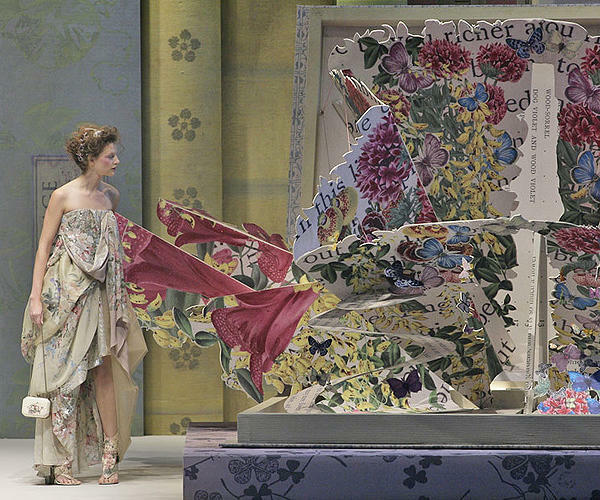 Some Russia-influenced collections : Alexander McQueen Autumn/Winter 2003-2004 (Russia through the Trans-Siberian Railway), Gucci by Frida Giannini Autumn/Winter 2008-2009, Hermès by Jean Paul Gaultier Autumn/Winter 2005-2006, Jean-Louis Scherrer Couture Autumn/Winter 1980-1981, Jean Paul Gaultier Autumn/Winter 1986-1987 (constructivist influence), Josephus Thimister Couture Spring/Summer 2010 (« Bloodshed and Opulence », based on Russian military uniforms), Kenzo by Antonio Marras Autumn/Winter 2009-2010 (Russian constructivism), vanessabruno Autumn/Winter 2011-2012, Viktor & Rolf Autumn/Winter 1999-2000 (« Russian Doll »), Yohji Yamamoto Autumn/Winter 2000-2001 (North Russia), Zuhair Murad Couture Autumn/Winter 2008-2009 (Russian Empire). 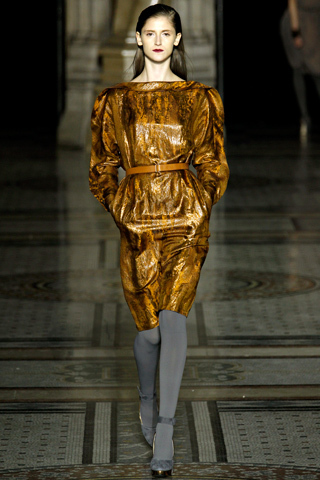 Gustav Klimt influenced the metallic clothes of the Nicole Farhi Autumn/Winter 2012-2013 Show. Some Gustav Klimt-inspired collections : Alexander McQueen Spring/Summer 2007 Menswear (eveningwear), Aperlai Spring/Summer 2012 (accessories), Cathy Pill Spring/Summer 2010 (« Go With The Flow », with Gustav Klimt-inspired prints), Frey Wille (« Klimt » line, in the « Art Collections », available each season), Manish Arora Autumn/Winter 2010-2011 (embellished dresses), MaxMara Autumn/Winter 2002-2003 (prints), Missoni Spring/Summer 2008, Pianurastudio Autumn/Winter 2008-2009 (Vienna Secession, especially Gustav Klimt), Stephen Burrows Autumn/Winter 2010-2011 (Gustav Klimt and Tiffany lamps), Versace Autumn/Winter 2005-2006 Menswear (printed silk shirts). 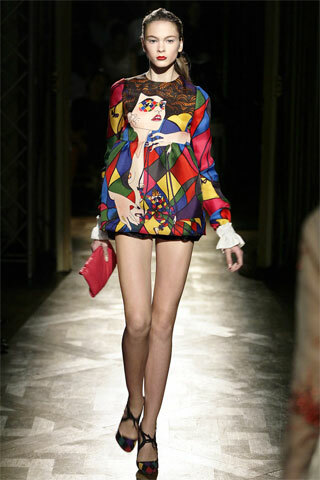 The Miu Miu Spring/Summer 2008 Show was inspired in part by Harlequin. Other collections with Harlequin : Eley Kishimoto Autumn/Winter 2008-2009, Erdem Spring/Summer 2011, Gareth Pugh Spring/Summer 2007, Gloria Carcangiu Autumn/Winter 2009-2010 (« Arlequine Futuriste »), Marni by Consuelo Castiglioni Spring/Summer 2009, Moschino Spring/Summer 2009, Popy Moreni (in the 70s and 80s, Popy Moreni designed several Commedia dell’arte-inspired outfits), Schiaparelli 1939 (« Commedia dell’arte »), Viktor & Rolf Spring/Summer 2008, Vivienne Westwood Autumn/Winter 1989-1990, Vivienne Westwood Spring/Summer 2012 (« Harlequin » tote). Moreover, Moschino has just designed the « Harlequin » collection, featuring Harlequin-inspired furniture, made in collaboration with Altreforme. 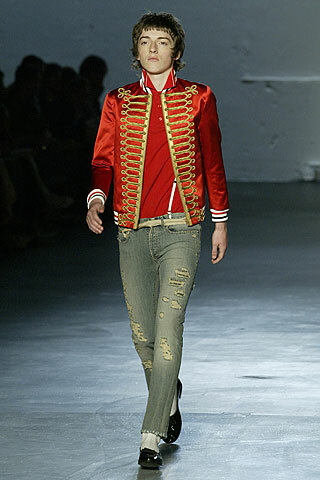 Peter Doherty was the muse of the Dior Homme by Hedi Slimane Spring/Summer 2006 Menswear Show. Some Peter Doherty-inspired collections or Peter Doherty’s collaborations : Albion Trinketry Autumn/Winter 2010-2011 (unisex jewelry, with Hannah Martin, sold exclusively at Joseph, in London), Anne Valérie Hash Couture Spring/Summer 2010 (Peter Doherty’s own military jacket was revisited), Dolce & Gabbana Spring/Summer 2006 Menswear (inspired by the Babyshambles), L.E.N.Y. 2009 (the English rocker designed a T-shirt, in aid of Al Gore’s Climate Project, for the 4th Limited Edition New York initiative), Peter Doherty X The Kooples Spring/Summer 2012 (unisex capsule line, in collaboration with Peter Doherty, based in part on the character he plays in Sylvie Verheyde’s « Confession of a Child of the Century »), Yatt Autumn/Winter 2010-2011 (T-shirt with Peter Doherty’s portrait and the slogan « F*ck Forever »). Moreover, Peter Doherty (shot by Mert Alas & Marcus Piggott) was the face of the Roberto Cavalli Autumn/Winter 2007-2008 Menswear ad campaign. Keith Haring is one of the graffiti artists from the 80s that were honored in the Louise Gray Spring/Summer 2010 Collection (« Oh no Babe »). Some Keith Haring-inspired collections or Keith Haring’s collaborations : Albino Autumn/Winter 2011-2012 (Keith Haring’s New York), Comme des Garçons X Keith Haring Autumn/Winter 2011-2012 (capsule line of printed sweaters and T-shirts, with the Keith Haring Foundation, launched in November 2011), Hervé Léger by Max Azria Resort 2012 (prints), Holly Fulton Autumn/Winter 2009-2010, Jean-Charles de Castelbajac (Keith Haring co-signed a « painting dress », in the early 80s, and designed, in 1990, the invitation card for the Jean-Charles de Castelbajac Autumn/Winter 1990-1991 Show), Nicholas Kirkwood Autumn/Winter 2011-2012 (12 shoes, with the Keith Haring Foundation, launched in February 2011), Stephen Sprouse (« Day-Glo » outfits in the 80s, with Keith Haring), Tommy Hilfiger (capsule footwear, for Spring/Summer 2010, with the Keith Haring Foundation), Topshop Unique Spring/Summer 2012 (Keith Haring-style hieroglyphic prints), Vivienne Westwood Autumn/Winter 1983-1984 (« Witches » ; moreover, Keith Haring created the invitation card for this World’s End collection).